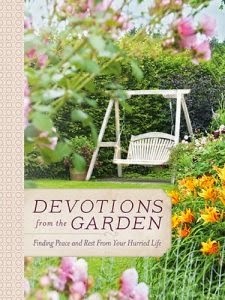 Nature's miracles and their impact on our lives are celebrated in the ninety devotions in Devotions from the Garden: Finding Peace and Rest from Your Hurried Life. Spending time outdoors, whether in the garden or simply just enjoying natural surroundings, is restorative and transforming. "Bottom Line, we need the Lord. Every morning of our life--no matter the season--we are wise to commit the day to Him. When this becomes a life giving habit, we may find ourselves better weather in the winter storms and summer time droughts. We may also find it easier to believe that although our cooler dormant seasons may not look as vibrant as our springs and summers, the spiritual harvest will still come" (p. 203). Each reflection in this book is short enough to read in a few minutes, but they are written in a way that stay with you. They include Scripture verses, along with prayers at the end of each devotion. The book is gorgeously presented, with color photographs of garden scenes, a ribbon bookmark, and a presentation page. The publisher has provided an advanced reading copy through BookLook Bloggers.